The state-of-the-art Centro de Arte Reina Sofia is a shining example of the Spanish flair for converting old-world architecture to contemporary purpose – in this case to meet the needs of a dynamic modern art collection. But while the collection of 20th century mostly Spanish art is exceptional, it’s not entirely in line with my particular tastes in painting. (I do love the Kandinsky and the early Salvador Dali but sorry, Miró, I just can’t figure out what’s the fuss) Like most of the crowd, I’ve come to see Picasso’s Guernica, arguably one of the most famous paintings of the post-war era. 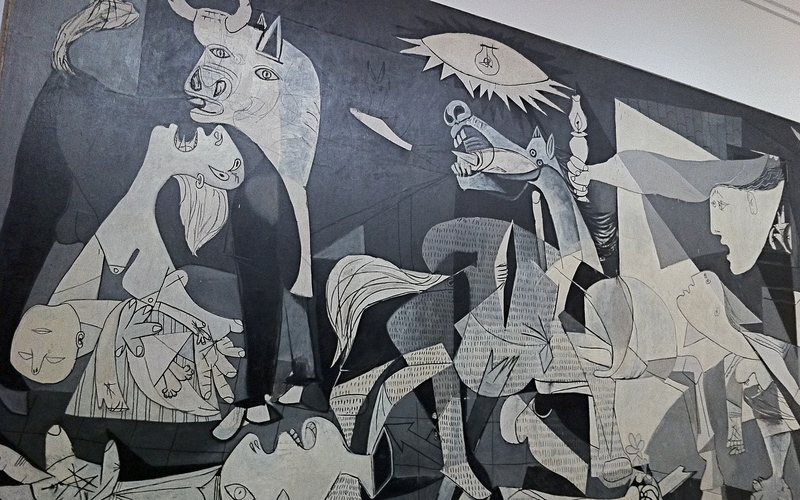 A defining work of cubism, where the disfiguration of the human form becomes an eloquent symbol of the world’s outrage at the horrors wrought upon the innocent by modern warfare, Picasso’s mural is a monumental 25-foot canvas that can barely control its humanity. Painted by the artist in response to the bombing of the eponymous Basque town by German and Italian forces during the height of the Spanish Civil War, the canvas shows a world wrenched by violence and chaos. Is it any wonder that Picasso’s vision continues to fascinate us?